The last half-century has seen a phenomenal increase in the volume and complexity of international business. Today's global economy allows multi-nationals to design their operations in a manner that may significantly reduce their taxes, particularly by taking advantage of tax incentives offered by many countries to attract geographically-mobile capital and activities. Since 1962, 19 countries have enacted specific statutory regimes to counteract the perceived abuse of controlled foreign companies (CFCs) located in tax havens. In three cases to date, CFC legislation has been challenged in legal proceedings on the basis that it contravened a tax treaty. 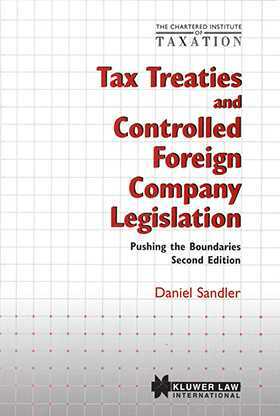 Tax Treaties and Controlled Foreign Company Legislation presents an in-depth analysis of the potential conflict between CFC legislation and tax treaties. The author also evaluates the potential conflict between the CFC legislation found in European Union countries and the EC Treaty. This is an important resource for international tax advisers seeking to maximize clients incentive access without triggering CFC legislation. Practitioners and academics will also want to read this work to understand existing and potential conflicts in this vein.